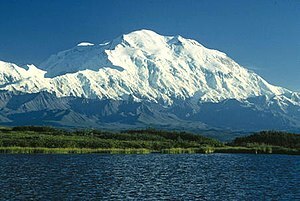 Mount McKinley in Alaska (USA). Pahaarr, Dunia ke surface me ek rise hae jisme ek chti rahe hae. A satellite view of the Alps, a mountain range in Europe. The Olympic Mountains, Washington state, USA. Ii panna ke 8 March 2013, ke 19:59 baje, pichhla time badla gais rahaa.